Look at where you’ll find triangles, squares, quadrilaterals, and circles: awesome. I’d like to add something that I (think that I’ve) noticed about my (and my students’) favorite problems. I have very, very clear memories of sitting with a few friends, working on some math problems in college. It’s 4 in the morning. The problem set is due in 5 hours, and there’s a sheet of paper in between the three of us. There’s something resembling a solution on it and we’re all wondering — is this right? Is this what we’re looking for? Good problems aren’t like that. You know when you’ve figured it out. You know when you’ve made progress, or hit on an insight. They don’t just reveal their constraints quickly — they give you feedback, encouragement and point out wrong turns during the entire process. I think you’re hitting much more in the overlap of your favorite kinds of problems and mine with this one. For me, 3 and 4 are the big reasons I like this kind of problem, especially 3. But I guess that makes sense for someone coming from the math circle side of things. As for your special notes, I’d be happy to know the research but it seems like an overwhelming task to me. And what do you mean by “keep a loose grip”? This is great. For me (personally), there’s a certain liberation in the opening sentiment of “Solve the problem you’re trying to solve, while also respecting others’ attempts.” Very wise. I need to remember that. I agree with Dan’s penchant for minimalist simplicity. At the same time, I’d like to make the case for problems that can’t be encapsulated in 140 characters. Sometimes a math problem requires a bunch of steps before revealing its true purpose, much like a novel which builds before showing its hand. Janet Napolitano says (about the proposed border wall between the US and Mexico), “You show me a 50-foot wall an ill show you a 51-foot ladder.” The question is simple and concise: Is a 51-foot ladder actually long enough?? Wonderful. But wonderful too is a conversation about the mathematics of calories: the interplay between food, metabolism and exercise. Though there’s no identifiable soundbite, it’s lovely–and surely valuable–nonetheless. Which is to say, It takes all kinds. Which was part of Dan’s point, yes? Nice problem! I really like this. Dan, you often talk about pseudo-context (where the fake real world is supposed to motivate the math. And you often give nice problems with real context (where the “real world” does motivate the math). … but I think it’s important that the math itself can be interesting to students without reference to the real world. (That’s not to say it’s without context, of course.) You do give us some examples like that (e.g., this one), but not as often. Another bonus: The area between circles and rectangles is fertile context for thinking about circles as limits of polygons. Another bonus: Representing figures as “points” in a plane is really, really great practice in abstraction. This is a great activity Dan. It is more open that what I used before — that is graphing the (perimeter,Area) to show that the maximum area is a square. How many of our students consider math problems something to rush through and get over with? bam bam bam bam “done!” is what our **successful** students do! Then they just sit there, waiting to be programmed for the next procedure. And our unsuccessful students are wondering whats wrong with them that they can’t be programmed. But with a problem like this, there are many “step 1s” and there are many extensions. The problem itself is merely the midpoint, the knot, the intersection of mathematical threads that come from, and go, anywhere. This is a lovely example of recreational mathematics. I used gnuplot to plot the equations I came up with for a circle, square, etc. Neato. Even though I love geogebra, and that’s where I went first with this problem, I think pencil and paper is the best way to have a student work this problem. This reminds me of a problem Ron Graham told me once. Take a triangle, any triangle, and subdivide it using a barycentric subdivision into 6 smaller triangles. Now take those 6 triangles and subdivide them, and repeat ad infinitum. Obviously not as succinct as your question, but on the other hand, they did publish recently on it. “If we list all the natural numbers below 10 that are multiples of 3 or 5, we get 3, 5, 6 and 9. The sum of these multiples is 23. “The prime factors of 13195 are 5, 7, 13 and 29. Pure gold when it comes to beginning computer programming students. All very understandable, but challenging. The best part about these problems is that they give you a sample problem that is a much smaller scale. For instance, on the last one, they tell you the factors of 13195, and it makes an excellent test case for the program. Small world. Just yesterday, I was interviewed by a student for a class project on expert-novice problem-solving. It was for a class called “Knowing and Learning.” After I solved the problem, I mentioned to the student how I thought this was perhaps not a very good problem to give people to see how they solve problems. I said how the problem both required a lot of specific content knowledge and that the problem requires a key “insight”. The problem, not surprisingly, fails most of Alan’s criteria and yours. The student didn’t actually pick the problem, it was picked for him. Oddly enough, the student was doing the interviews, but didn’t even know how to solve the problem. I also agree with Schoenfeld’s email item C about important mathematical ideas. In designing and revising problems, anticipating student responses, and basic planning for a class discussion it seems important to be explicit about what mathematics students should understand as a result of this work. It doesn’t have to be the same for every teacher in every classroom. I’ve pushed this a few times on this blog: What should students understand as they come away from their work on this problem? Belinda: I’ve pushed this a few times on this blog: What should students understand as they come away from their work on this problem? Off the top, I’d like students to see that if a polygon has a fixed perimeter and a fixed number of sides, you can get the most area by making every side congruent. (eg. the rectangles are bounded above by the squares.) And if you have a fixed perimeter but you let the number of sides do as they please, you enclose more and more area by adding sides to the polygon, which constitutes a limit that ends in a circle. Students should understand what points on the x-axis mean. 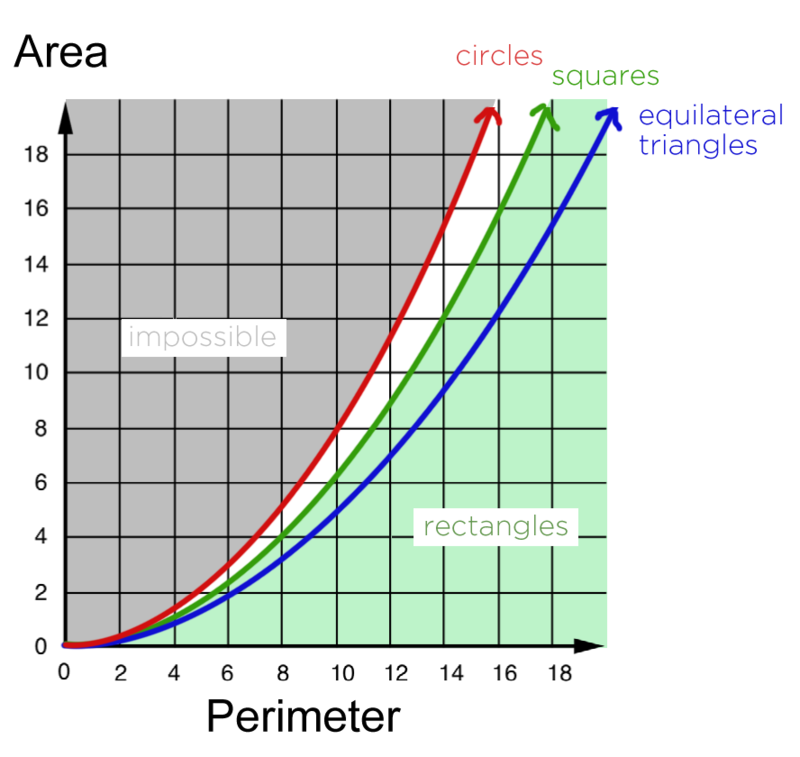 Students should understand why the impossible points are impossible points and why the values for perimeter can increase endlessly even for a fixed small value for area. I’m just spinning here, though. Toss me some more. PS. 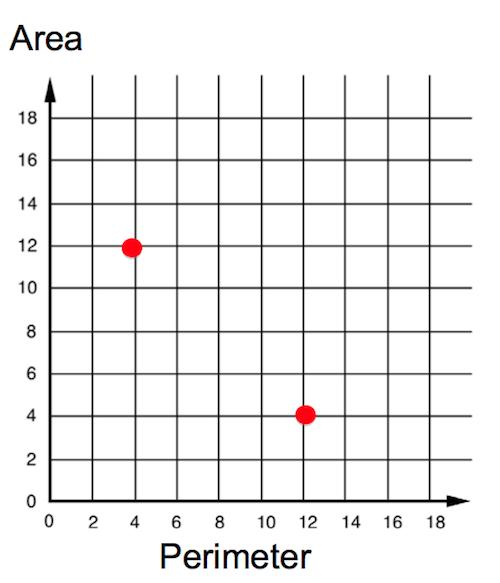 Scott’s Geogebra applet is awesome. It’s got form and function nailed. I love Dan’s answer on what students should take away from it. There’s really A LOT of content there. And the technique/methods that they’re using to understand all of that. In this case it’s representing geometric figures as points in the plane, but the lesson that you can understand what’s going by representing things somewhere you can visualize (this method lets you, in some sense, visualize all geometric figures at once!) is very useful in general. @DavidC I think the math content is the less important point, and the general strategies of “Would you just draw a rectangle for me? Any rectangle.” and “Would you do that with five more rectangles and let me know what you notice, if anything?” — to me the big goal is to get the kids to learn to ask themselves that question. To me the most important thing is that we explicitly point out these strategies to the students, so that they can start learning to use them on their own, rather than continuing to use them only when they’re following directions or being led that way with a carefully designed prompt. #19 Sue: Oops! I meant here on Dan’s blog, which I think is fantastic. I love the generation of goals! There are mathematics content goals, representation goals, problem solving goals, and self-reflection goals. All of these are worthy goals for a mathematics lesson and several serve to create a productive classroom climate. However, I don’t agree with Joshua that the “math content is the less important point”. Maybe I’m misinterpreting that statement from him, but I think the math content goal (what students should understand, not just what they should be able to do) should be the most important. Otherwise, how will I know whether students understood the math I wanted them to learn? Dan’s list of what students should understand is a great start. The first two sentences in his list would make for a super summary at the end of the work on this problem. Making that connection explicit through the goal of what students should understand helped me to think about what to look for in student work, and what to listen for or introduce into a discussion of the problem. Dan’s list is amazing — Lots of depth here. (1) Great. Let’s simplify to a rectangle. Why does making the sides closer in length (with the same perimeter) increase the area? (2) Lots here — talking informally about limits will be great. (3) Now we can have fun with fractals, etc! There’s even good stuff for college-level topology students: Define a topology on figures in the plane. Is this map from there to the plane continuous? This has got me thinking of a different problem, but with the same theme, that I had seen in a book by Dan Pedoe. If you write the equation of a circle in the form x^2 + y^2 – 2ax – 2by + c = 0, there are all sorts of interesting things that happen when you study the point (a,b,c) graphed in 3 dimensions. Great problem, lots of links between different topics. Have visions of my class, sticking the shapes onto drawing pins, and putting them into the display board at the right point. Might make a great consolidation at the end of term. Going to have to think about how this works with 3D shapes: surface area vs volume. I love this problem too. It has depth, intrigue and fabulous mathematical content. I once had a mentor/teacher who seemed to have an endless supply of problems like this: problems that at first glance seemed simple enough, but expanded to multiple levels of depth as the solution unfolded. He made it seem so easy, but now I can more fully appreciate the difficulty of finding and/or creating problems with a rich quality such as this one. Dan, can I ask you to more fully explain what you mean by “Keep a loose grip on your own sack of solutions?” I’m not quite sure how to interpret that suggestion. Thanks for the endless intrigue. Clearly sloppy wordsmithing on the “sack of suggestions” remark. You’ve got your solutions. They’re in a sack. Don’t hold on to them too tightly. Don’t be afraid to cut a few loose. Pingback: dy/dan » Blog Archive » What’s The Difference?